There is nothing I love more in my home than my kitchen cart. Not your bed? you ask. Your couch? Your roommate? Nope! Because here鈥檚 the thing: I built it out of trash. Let鈥檚 back up. When I moved into my apartment, I knew that, per usual, the kitchen would be tricky. The cupboards are pretty small and there isn鈥檛 much counter space. Then it happened. I was walking home one day and spotted two IKEA LACK tables on the sidewalk. 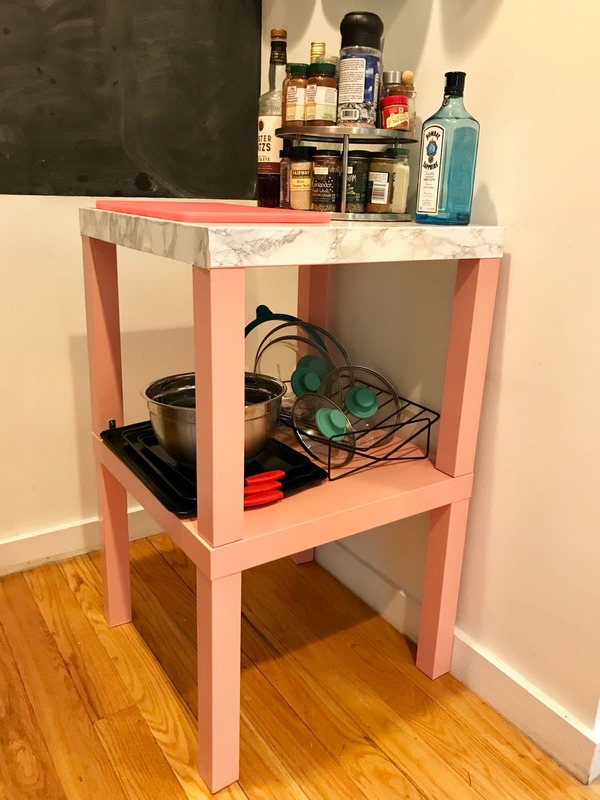 The paint on one of them was bubbling and I had no idea what I would use them for, but these tables are DIY gold so I grabbed them and hauled them up to my fourth-floor walkup. After staring at them for a few days I realized they would be a perfect solution to my tiny kitchen troubles. I was going to turn them into a kitchen cart! 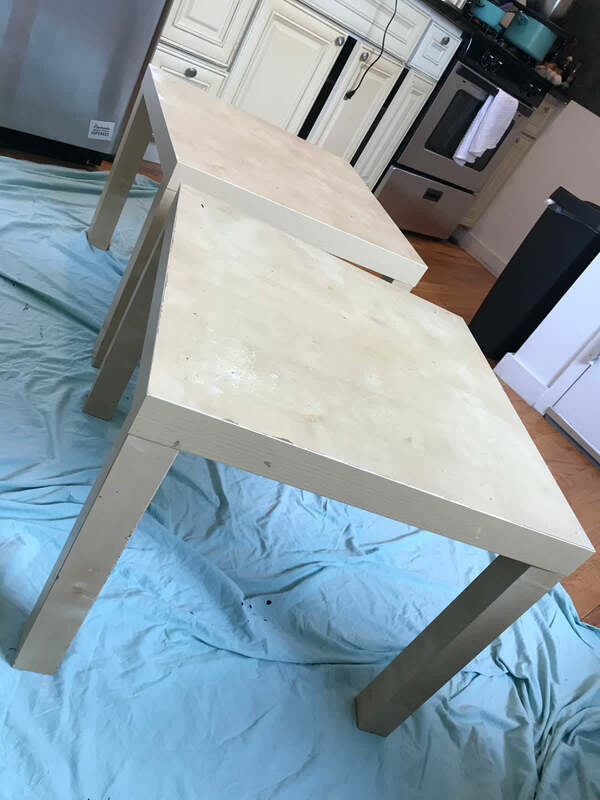 After painting the tables and leaving them to dry overnight, I put the pieces back together, stacked the tables, and attached the legs of one to the top of the other with four L-brackets. If I could do the project over, I would use Liquid Nails instead. The L-brackets don鈥檛 look bad, but the exposed hardware doesn鈥檛 really fit with the rest of the vibe. Then I got to work with Con-Tact Paper. It鈥檚 pretty straightforward to use, but requires a lot of patience that I definitely do not have. The trick is to pull the backing off while simultaneously smoothing the sticker onto the surface so it doesn鈥檛 bubble. I used a long ruler to smooth things out as I worked. The first piece was smooth sailing (no pun intended) but my patience started to wane when I was working on the second piece. No matter what I did, the paper kept bubbling. At that point I was ready to throw the whole thing out, so I took a break. When I returned I realized that I was overlapping the two layers too much. The paper peels off easily, so I was able to move it over a few inches and I was soon back in business. I used an X-Acto knife to cut off the edges and was pleasantly surprised at how realistic my 鈥渕arble top鈥� had come out. I stacked books on the paper and left it to flatten overnight. In the morning, I put my new cart in place and got to organizing. What was once a cramped kitchen now feels like the perfect size. Honestly, I don鈥檛 think I鈥檒l ever need a bigger kitchen. My cookware hangs on the walls and the pot lids sit on a rack on the bottom shelf of the cart. I do all of my prep work on top, then turn around to throw the ingredients into a pan on the stove or stick them in the oven. And yes, the oven door has space to open all the way with inches to spare. 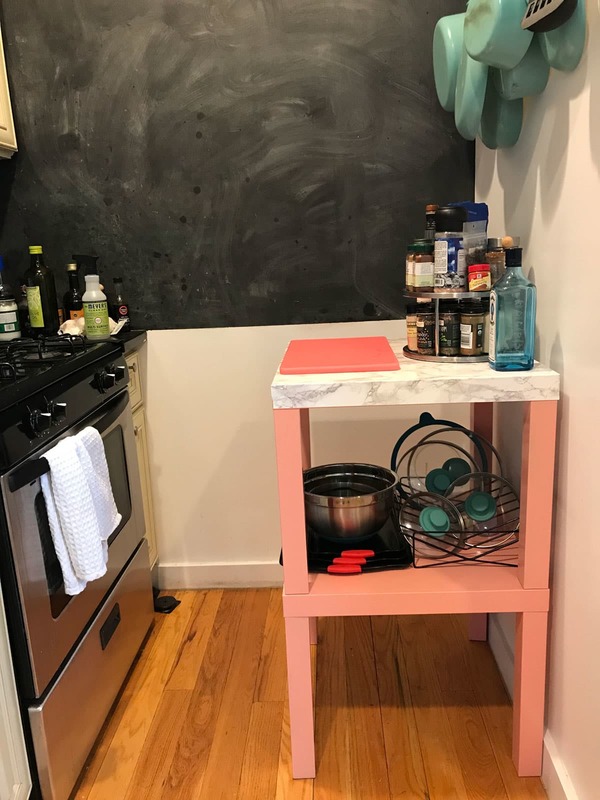 The cart is surprisingly sturdy and is the perfect height for me (at 5鈥�2鈥�, I鈥檓 a touch too short for most kitchen counters). If you want to add some extra height, you can add casters to the legs and make it a proper cart. The color pops, but blends with the rest of the colorful kitchen. I had the contact paper on hand from a previous project and snagged the tables off a curb, so I only spent $12! 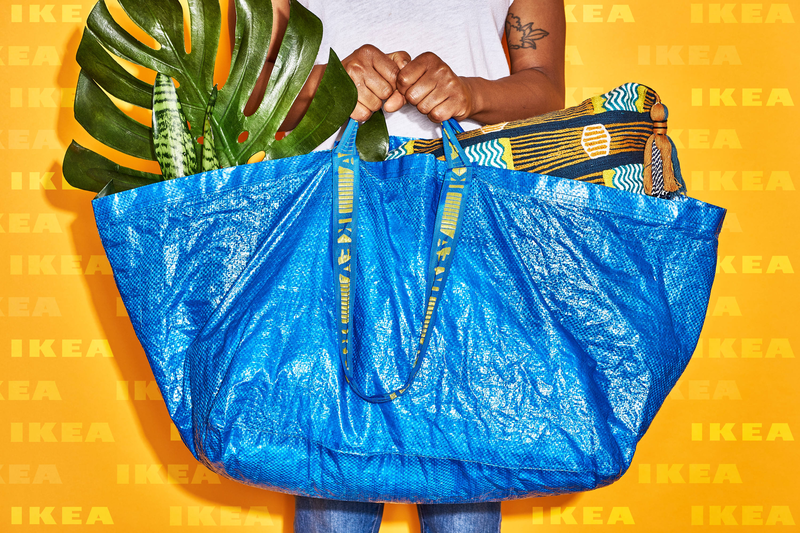 But even if you were to buy all the pieces, it would still only cost you around $45.